This recipe can be found on p. 79 in Amy’s Favorite Cookbook. These little gems take a bit of time to roll, but they are so worth it! I usually make a double batch of them, have the family help me roll them and then flash freeze them and put into Ziplock bags and store in the freezer. If you have a last minute party or get-together, just thaw them slightly, fry in oil and serve with soysauce. 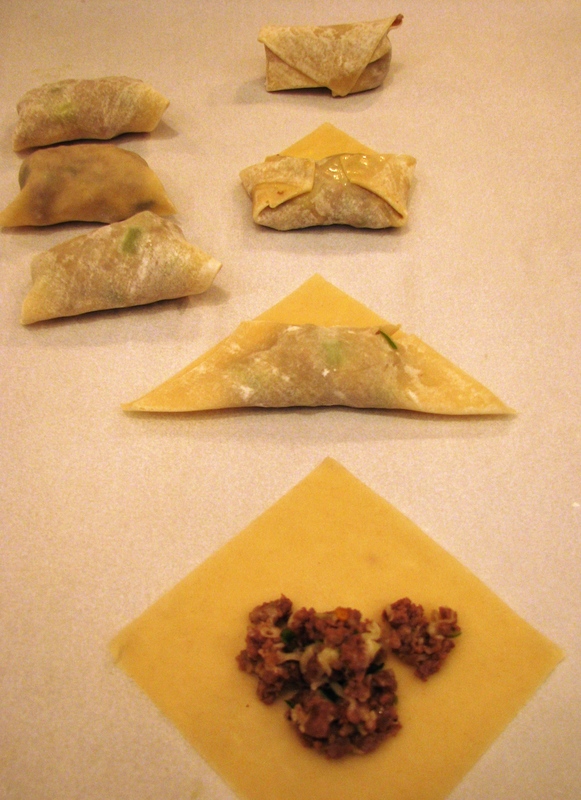 Take your egg roll wrappers/wonton wrappers out of the refrigerator at least an hour before you want to use them. Cold wrappers crack and cause holes in your egg rolls. If the egg rolls have holes when you fry them, the insides get cooked too quickly. Roll your egg rolls immediately after you make the mixture. Sometimes I’ll put the mixture in the refrigerator and roll them later. I usually regret this as the filling is cold and the egg rolls do not roll as nicely. You end up with holes and cracks. If you are going to use them in 1-3 days, do not freeze them. Layer them between parchment paper. I really like them fresh. The texture is so much better when you do not freeze them. However, if you are going to do them, it’s best to make a lot and then you need to freeze them. When rolling, use a small amount of filling, maybe even a teaspoon. Too much filling will cause cracks. To roll, place the wrapper with the point of one corner pointing towards you. Add the filling. Roll half way. Fold in sides. Place a bit of egg on top point and finish rolling. Seal outer point with more egg. Make sure you keep the wrappers and eggs rolls covered with a damp paper towel at all times. Otherwise the wrappers and egg rolls will dry out.